When I was a kid, my favourite aunt was a smoker. It bothered me that she smoked, because if I knew anything, it was that cigarettes were bad for you, and I worried for her. I wondered, as I stuffed my face with potato chips and chocolate bars, why she would do something that was so obviously harmful to her health. One Christmas, I gave her a single, glass-encased cigarette as a present, with the words “In case of emergency, break glass” stencilled on the case. It was meant to encourage her to quit, although exactly how it was supposed to do this escapes me at the moment. It has been many years since my aunt smoked, and while I do not know what time of year she quit, I do know that butting out is a popular New Year's Resolution. Many people are currently two weeks into a difficult process, perhaps with the help of nicotine patches and gums that are readily available at your local pharmacy. But there's one product Canadians will not have easy access to in order to help them quit: smokeless electronic cigarettes, the sale of which is prohibited in this country. 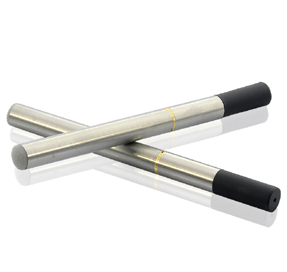 Electronic cigarettes are shaped like regular cigarettes, but they contain no tobacco and they are not burned. They are essentially small, battery-powered nicotine vaporizers. The tip of an e-cigarette glows when it is puffed on, and the vapour it produces looks like smoke but contains none of the many carcinogens found in tobacco smoke. Hollywood stars like Katherine Heigl (who “vaped” on The Late Show with David Letterman) and Johnny Depp have switched to e-cigarettes. In fact, 2.5 million of the devices were sold in the United States alone in 2011. But while you may have seen similar products on sale at a convenience store near you in this country, Canadians can only legally purchase a neutered, nicotine-free version of the popular product. That's because of a March 2009 Health Canada Advisory stating that their sale is “not compliant with the Food and Drugs Act” and that “no electronic smoking products have been granted a market authorization in Canada.” The Advisory also states that “[p]ersons importing, advertising or selling electronic cigarette products in Canada must stop doing so immediately.” Some companies are nonetheless willing to ship electronic cigarettes to Canada, but those shipments risk being seized at the border. Why would Health Canada ban electronic cigarettes? It's true that they are a relatively new product, invented in 2003, and so the long-term effects of vaping are unclear. But the long-term effects of inhaling tobacco smoke on a regular basis are quite clear, and quite harmful. Common sense dictates that inhaling vaporized nicotine should in all likelihood be less harmful. And it's not just common sense. As Jesse Kline wrote a year ago in an article for the National Post, “A 2010 paper published in the Journal of Public Health Policy reviewed the available data and concluded that, 'electronic cigarettes are a much safer alternative to tobacco cigarettes. '” Only a government bureaucrat could imagine otherwise. "If Health Canada officials tolerate and even appear to recommend vaporization over combustion for medical marijuana users, why change their tune when it comes to tobacco? As Kline suggests, maybe billions of dollars of tobacco taxes are clouding their vision." If Health Canada officials tolerate and even appear to recommend vaporization over combustion for medical marijuana users, why change their tune when it comes to tobacco? As Kline suggests, maybe billions of dollars of tobacco taxes are clouding their vision. I am a lot less judgmental than I was as a child. I understand that smoking is a dangerous activity, but I respect people's rights to make their own decisions about whether or not to engage in dangerous activities. I have even become a casual smoker myself, enjoying the odd cigarette with a glass of wine or a beer, although I can easily go weeks without a single drag. But many people cannot forgo that nicotine fix. An electronic cigarette could help, as it not only provides the drug smokers are addicted to, but also simulates the action that has become such a habit. It is also very probably a safer substitute for people who cannot or will not give up nicotine. The fact that this has not been proven beyond the shadow of a doubt is not reason enough to ban electronic cigarettes. They could very easily be made available at the consumer's own risk until sufficient evidence, whatever that might be, has been accumulated. H.L. Mencken famously defined puritanism as “the haunting fear that someone, somewhere, is having a good time.” The thing I failed to understand when I was a kid is that people enjoy smoking. Could puritanism be the real reason behind the Canadian ban on e-cigarettes? As the above-mentioned blog recommends, I encourage you to write to Health Canada and your Member of Parliament to ask them why we need to be “protected” from making our own decisions about a product that is freely available south of the border.